General Hospital (GH) spoilers for the next two weeks tease that some tricky situations are coming up. 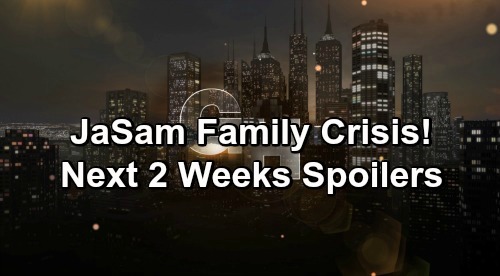 During the week of March 25-29, Sam McCall (Kelly Monaco) will feel backed into a corner. She’ll have to pick a side after a fight between Shiloh Archer (Coby Ryan McLaughlin) and Jason Morgan (Steve Burton). Danny Morgan (T.K. Weaver) will be at the heart of the conflict, so this could lead to some genuine crisis issues for “JaSam.” Jason has supported Sam’s efforts to dupe Shiloh and help Kristina Corinthos-Davis (Lexi Ainsworth), but he’ll draw the line at letting Shiloh bond with Danny. However, Sam won’t want to blow her cover, so she may back Shiloh up and argue that Jason’s overreacting. General Hospital spoilers say Jason will get arrested soon, so it may be thanks to this altercation with Shiloh. Later, Sonny Corinthos (Maurice Benard) and Alexis Davis (Nancy Lee Grahn) will have a crisis meeting. They’ll be desperate to save their stubborn, gullible daughter. Kristina is shutting her family out and only listening to Shiloh, so Alexis and Sonny will want to figure out a solution. Over with Dante Falconeri (Dominic Zamprogna), he’ll be haunted by memories of what he’s been through. Some deadly nightmares will force Dante to wonder if he’s a danger to his family. He’ll kill Lulu Falconeri (Emme Rylan) in one of his dreams, so that’ll obviously be disturbing. During the week of April 1-5, it looks like Oscar Nero (Garren Stitt) may have another seizure. General Hospital spoilers say Josslyn Jacks (Eden McCoy) will reach out to Carly Corinthos (Laura Wright) while Drew Cain (Billy Miller) and Dr. Kim Nero (Tamara Braun) receive awful news. Oscar’s next medical ordeal should be much worse than his last one. Other General Hospital spoilers say Jordan Ashford (Briana Nicole Henry) will get updates on something important. Could this involve a kidney that’s become available for Jordan? Could it involve a case instead? Ryan Chamberlain (Jon Lindstrom) is likely alive, so that could become another problem for Jordan to tackle. GH fans can also expect a warning for Willow Tait (Katelyn MacMullen). Despite Harrison Chase’s (Josh Swickard) attempts to protect Willow, Shiloh may rev up the pressure. Next, Dr. Hamilton Finn (Michael Easton) will contemplate a bold move. He’ll ultimately decide he’s prepared to take the next step, so is a proposal in the works? That’s certainly a possibility to consider. In the meantime, Anna Devane (Finola Hughes) will be busy trying to help Peter August (Wes Ramsey). He’ll need some advice, so this may involve finding a way to move things along with Maxie Jones (Kirsten Storms). Of course, the situation could get complicated thanks to Chet Driscoll (Chris Van Etten). Lulu seemed to think Maxie and Chet would be good together, so Maxie may mull over the idea. General Hospital spoilers state that Maxie will wrestle with what’s in her heart. Will Peter lose his chance to be with Maxie or is this just a little bump in the road? We’ll keep you posted as other GH details emerge. Stay tuned to the ABC soap and don’t forget to check CDL often for the latest General Hospital spoilers, updates and news.